Precor treadmills are always at the top of the list when it comes to high-end machines that bring all of the great features of health club equipment to the residential market. They are known for quality construction and ergonomic design, giving you the best possible workout experience. Precor was created by David Smith under the name of Precision Corporation in 1980. After a series of mergers, it became a subsidiary of Amer Sports Corp, one of the largest equipment companies in the world. The company also owns well-regarded brands such as Wilson, Salomon and Suunto, all leaders in their respective industries. Over the past 30 years, Precor has established itself as one of the top choices for residential and commercial equipment, and the company continues to bring innovation to the industry. The Precor treadmill lineup changes often, but at any given time there are a half a dozen residential machines for sale. Currently you have the Energy Series and the more advanced Precision Series. The lower priced Energy Series consists of the TRM 211, TRM 223 and top of the line TRM 243. The TRM 211 has Energy Stride shock absorption, speeds up to 12 mph, up to 15% incline, 3.0 CHP motor, 57″ x 20″ deck, 6 built in workouts and a 300 lb. max weight capacity. The TRM 223 gives you all of the features of the 211 plus a handful of additional workouts, 2 user profiles and wireless heart rate monitoring. The TRM 243 improves upon the 223 with 23 built in and 16 personalized workouts and 4 user profiles plus a touch screen display with Preva workout tracking to keep tabs on your workouts. Although the Energy Series is certainly gym quality, the Precision Series is even closer to what you’d find in the health club, with a much more advanced cushioning system. The TRM 425 has Ground Effects Impact Control, which gives you the ideal amount of give/firmness at every part of your stride, as well as Integrated Footplant technology, which automatically adjusts the belt speed to reduce impact on your joints. It has a shorter but wider deck than the Energy Series, at 56″ x 22″ deck, wireless heart rate, 9 built in workouts, 2 user IDs plus decline capability on top of incline. Man weight capacity jumps to 350 lbs. The higher end TRM 445 gives you everything the 445 but with the same amount of workouts, user profiles, touch screen and tracking that the TRM 243 has. All of the Precor treadmills are built strong and virtually maintenance free, with solid cushioning and effective workouts. Precor treadmills have always been well received, and have made a strong showing in the residential market as well as in the commercial space. The reason for this is because they make a rock solid machine with a ton of science behind the design to maximize results and minimize impact. 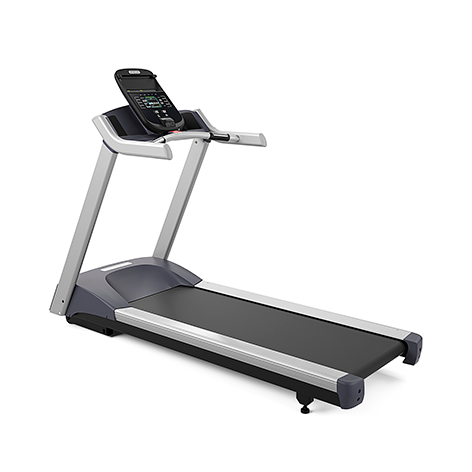 Both the Energy Series and Precision Series consist of great treadmills with incline capability, impact-reducing belts, a nice variety of workout programs and even touch screens with tracking on the higher end models. Precor prides itself on the extensive research they do to ensure that their treadmills stand out from the rest. This is evident in the quality of their suspension system, especially on the Precision Series machines with the Ground Effects and Integrated Footplant technology. This is a powerful asset as it relieves the user from the stress of lubricating the belt monthly (a messy and uncomfortable process). You can work out as hard or as often as you’d like without ever having to worry about taking care of the belt. All of the residential treadmills have the same 3.0 CHP continuous motor. It is resistant, silent and powerful, no matter how intense your workouts are, able to easily handle whatever you throw at it. The cheapest home treadmill costs around $2,000, but most of the Precor treadmills are $3,000 and above. However, you do get a gym quality machine that can stand up to years of punishing workouts. You receive only 10 years for parts maximum and 1 year for labor. From our point of view, the 1 year labor is too short for the price paid. Precor treadmills are useful, efficient, easy to use, durable and have a beautiful design. On the other hand, they are expensive. If you have the budget, they’re certainly a great choice. At the same time, you may be able to find a better machine from Matrix and Life Fitness. For the best deals definitely start at the official Precor site as they often feature sales and special pricing. That’s where you will find any discounts that the company is offering. You can take a look at the entire Precor treadmill lineup at the company site to see all of the current models for sale.